Spanish explorer Juan Ponce de Leon is credited with coming ashore and claiming "La Florida" for Spain on this date in 1513. While it has long been accepted that de Leon landed with his three caravels near St. Augustine and became the first European of record to see the peninsula, scholars have recently challenged details of that historical account. 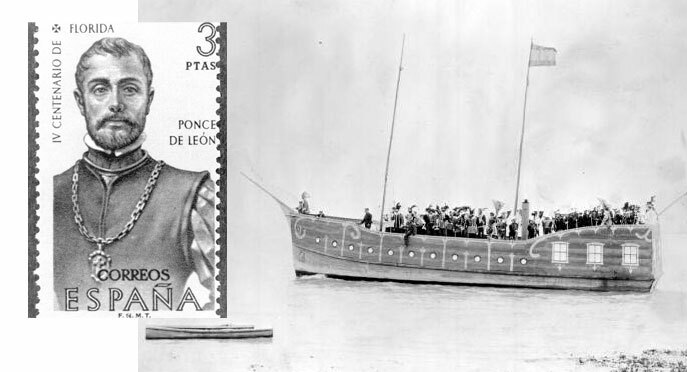 Juan Ponce de Leon is commemorated on a stamp in Spain, left, while St. Augustine residents in 1923 re-enact his landing, right. Photos: State Archives of Florida. Florida Memory. Mariner Douglas Peck used modern navigational technology to conclude de Leon actually landed on Melbourne Beach and published his conclusion in Florida Historical Quarterly in 1992. As a result, both St. Augustine and Melbourne Beach commemorated the 500th anniversary of the landing last year. Ponce de Leon's name became linked to Florida history commercially in 1882 when Henry Flagler opened Hotel Ponce de Leon in St. Augustine. The city sanctioned a Ponce de Leon celebration in 1907. The notion that he searched for a "Fountain of Youth" is now accepted as myth. Native American associations protested last year's commemorations by pointing out that Ponce de Leon sought to enslave native peoples he found here. And some scholars argue that he was not the first European in Florida and was preceded by Portuguese or English explorers.